The Pacific Ocean laps up onto the beach behind our hotels; large, brightly colored parrots squawk “hola” from the trees; there’s a pair of Bengal tigers with a cub at the bottom of the steps from my room; and right around the corner is a spacious conference room with banners outside for the Second International Conference on the Humanitarian Impact of Nuclear Weapons. The man who shuttles me to my room is curious to know what this is all about, and in no time at all he gets it that something very different from the usual business or government conference is about to happen in Nayarit. He expresses real pride that Mexico would host a large group of countries that want to eliminate nuclear weapons from the world. At the opening of the two-day ICAN campaigners meeting preceding the government conference, we learned from the Foreign Ministry that 146 States have now registered—16 more than registered for the first such conference in Oslo last year. This is not a numbers game, and not all of these countries are ready to jump onto the Ban Treaty train, but this is surely a sign that the humanitarian arguments for banning and eliminating nuclear weapons are changing the way people are thinking and talking about this issue. More important, it’s a sign that the States already free of nuclear weapons are feeling empowered to take the initiative on nuclear disarmament, even without the cooperation of the nuclear-armed States. They’ll have to, because the P5 are sticking with the boycott strategy they agreed upon in Oslo. India and Pakistan will be here, but the US, Russia, China the UK, and France will not. Neither will Israel or the DPRK. The US State Department went on a fishing expedition in the weeks before the conference, trying to find out whether this was just a scientific meeting about humanitarian consequences, as Mexico has framed it, or whether the conference is really a cover for a political process leading to a ban treaty. 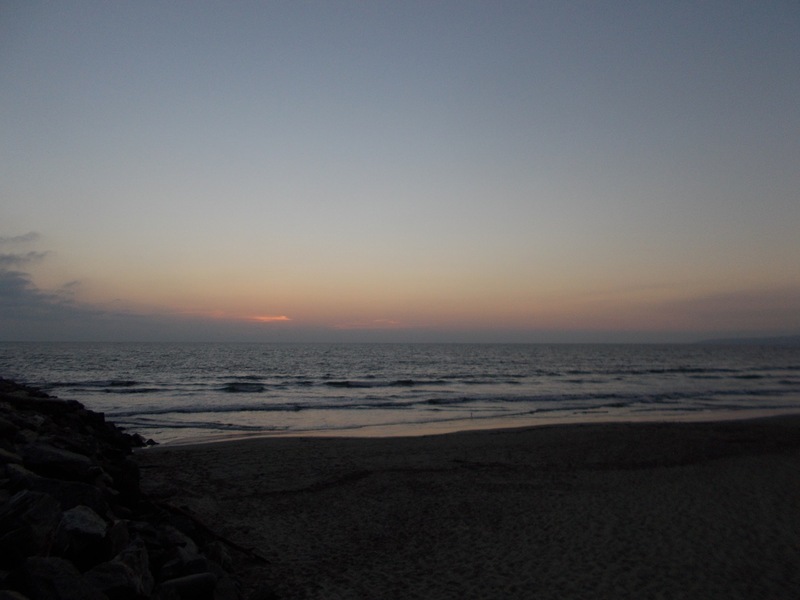 The answer didn’t really matter, because the US and the others were never planning to come to Nayarit in any case. But the idea that such a large number of countries—including some European allies—might go on record prohibiting nuclear weapons in the same way chemical and biological weapons, landmines, and cluster munitions have been prohibited, is not going over well in the nuclear capitals. In other words, we’re doing something right. The answer to the US question does matter, however, because Mexico has made it very clear that this is a scientific conference, and that there is no predetermined outcome. The ban treaty is not on the agenda. Neither is any other specific proposal for how to achieve a world without nuclear weapons. What is on the agenda is a deeper, more extensive presentation of the medical, environmental, social, economic, and humanitarian catastrophe that would ensue if nuclear weapons are ever used again, along with presentations on the risk—and the likelihood—that this catastrophe is inevitable if the weapons are not eliminated. The State delegations will have an opportunity to propose what they want to do about this during a two-hour closing session. Jans Fromow Guerra and Ruby Chirino of IPPNW-Mexico, and Carlos Umana of IPPNW-Costa Rica (behind) are among the dozen IPPNW activists who are part of the 120-member civil society delegation. 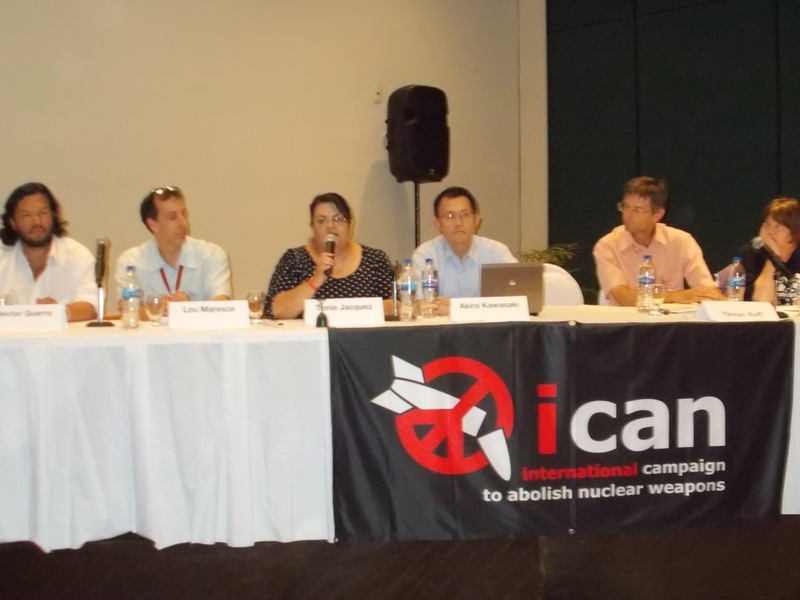 What ICAN wants them to propose is that the next step after Nayarit will be the beginning of a process for a ban treaty that will compel the nuclear-armed States to eliminate their nuclear weapons. 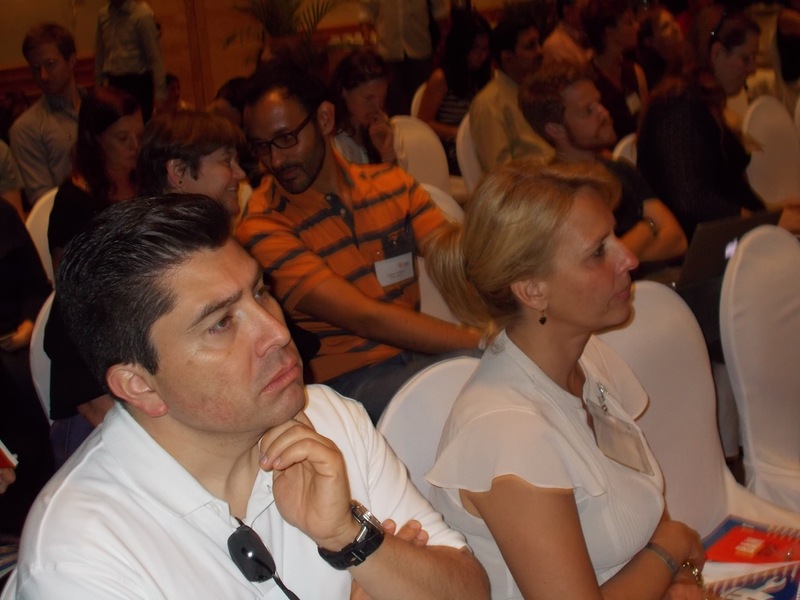 That goal is no secret to our Mexican hosts, to the P5, or to any of the other State delegations present here. They can read all about it on ICAN’s website. The excitement this campaign is generating was on full display during the first day of the campaigners meeting yesterday. More than 120 activists from some 40 or 50 countries spent the day updating each other on campaign activities and plans, debating campaign strategy, and just generally gearing themselves up for the opportunity to make our case to what we hope will be receptive governmental ears. What struck me more than anything else during a fast-paced session of campaigner presentations was the diversity of the faces and voices in the room—by all the usual measures of diversity and then some! ICAN has really gotten that part right. There have been other times in the decades-long history of campaigning for nuclear disarmament when it looked like a window might be opening for some real progress. Such windows have never stayed open for very long. What may make this time different is the new engagement of so many people who understand the impact of nuclear weapons on their lives, who want to do something about that, and who are getting more and more confident that they can.